Are you in the mood for a delicious beef stew? Is so, I have a great recipe for you to try out. 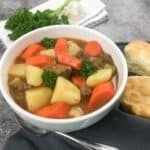 Paula Deen’s Old-Time Beef Stew is an easy traditional and classic vegetable beef stew recipe that makes a comforting, delicious meal any time of the year. Quick note: This post contains affiliate links. Please read my disclosure statement for details. Paula Deen is a well-known chef from Savannah, Georgia. She is best known for her rich, savory, traditional southern meals and desserts. She has published 15 cookbooks, been on several television cooking shows, has her own line of bakeware and cookware, and owns and operates The Lady & Sons restaurant and Paula Deen’s Creek House with her sons, Jamie and Bobby. She’s toured the United States where live audiences can watch her, and sometimes with her sons, prepare a complete meal, then share it with the audience. She came to Vicksburg, Mississippi, several years ago for a show. My mom and I went to see her show and we really enjoyed it. After the show, my mom purchased this cookbook for me, Paula Deen’s Kitchen Classics, and this cookbook is where this beef stew recipe is from. Step 1. Brown the meat in a hot skillet. This process sears the meat and locks in the juices. You don’t cook the meat through, only the surface gets a quick, brown, crisp outer layer. Step 2. After browning the beef stew meat, add all the seasonings and water then simmer for 1-1/2 hours. This slow-cooking process will ensure super tender, flavorful meat and rich broth. You will add the carrots, potatoes, and celery later. Step 3. After the beef, water, and seasonings have simmered for 1-1/2 hours, then add the vegetables and simmer for another 30-40 minutes. Add the cornstarch and water mixture to thicken. Eat and enjoy! This recipe makes 6 servings. 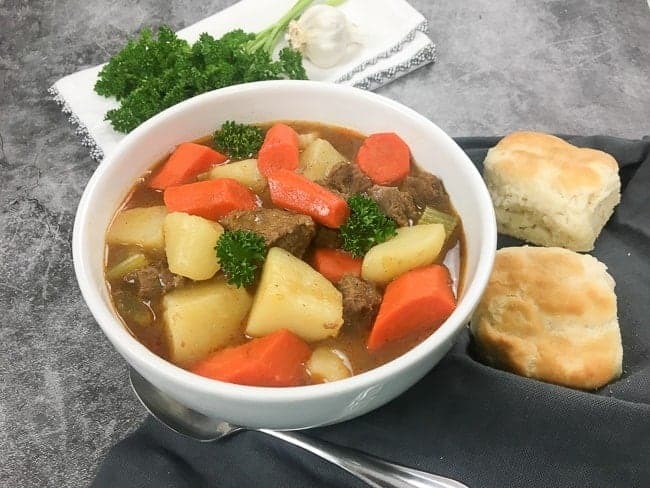 Paula Deen's Old-Time Beef Stew is an easy classic vegetable beef stew recipe that makes a comforting, delicious meal any time of the year. Brown meat in hot oil. Add water, worcestershire sauce, garlic, bay leaves, onion, salt, sugar, pepper, paprika, and allspice. Cover and simmer 1-1/2 hours. Remove bay leaves and garlic clove. Add carrots, potatoes, and celery. Cover and cook 30-40 minutes longer. To thicken gravy, remove 2 cups hot liquid. Using a separate bowl, combine 1/4 cup of water and cornstarch until smooth. Mix with hot liquid and return mixture to pot. Stir and cook until bubbly. Note: after the beef has simmered for 1-1/2 hours, add more liquid if desired. It’s my pleasure to share this delicious recipe of Paula Deen. 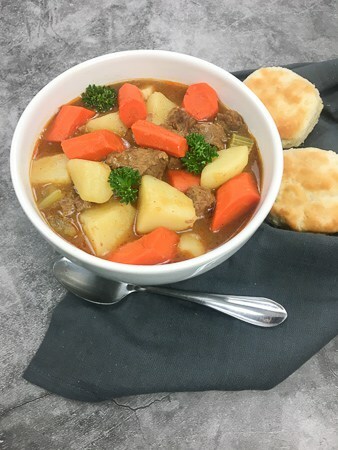 My family loves this stew and I hope that you and your family does, too! If you make this recipe, please share with me on Instagram. Tag me at @mykitchenserenity or hashtag #mykitchenserenity. I’d love to hear how your’s turned out. This is a great recipe. I love that there are not a bunch of ingredients and I know exactly what’s in it. I can hopefully also make this in my crock pot. Thanks, Shannon! I have not tried this particular recipe in the crock pot. If you do, let me know how it turned it. I love my crock pot! Sometimes there’s nothing better than a warm, hearty stew. I’m loving all of those simple ingredients!